In looking at different definitions with different perspectives and a business lens, the one above made the most sense to me. After 16 months, it was time to revisit a diagram created for “A Guide to Understanding Social Customer Relationship Management CRM”. I will not go so far as to call my earlier work wrong, naïve is a better descriptor. The evolution diagram contained my thought process at that time. Without over using the concept, my own thinking has evolved. For starters, the term ‘Social’ has become a blocker of progress. The attempted isolation of the social components from Customer Relationship Management CRM do both concepts a disservice. The SocialCustomer Relationship Management CRM discussion has pushed Customer Relationship Management CRM into a bit of corner. How can a relationship exist without social elements? The constant discussions of definitions are nothing more than a distraction. We simply need to focus on achieving business results; so let’s get moving. Customer Relationship Management CRM needs to incorporate the social elements (time, place and context) – call it what you want, define it how you will. Both the technology and the strategy of Customer Relationship Management CRM need to evolve, and then need to do so in lock step with each other. The fabric of any organization is the people, so who better to shepherd the change and embrace the technology? It cannot be people from just one part of the organization either, it needs to be a team effort. 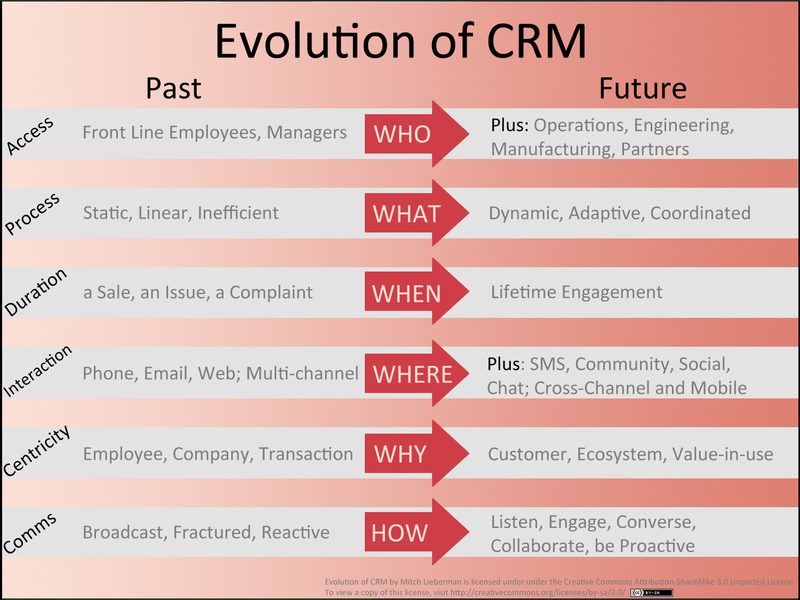 You may believe that Customer Relationship Management CRM needs to evolve into a different ‘something’, possibly needing a different name; to each their own. I am not saying I will not use the term Social Customer Relationship Management CRM, as I am perfectly willing to be a non-conformist, as long as I fit in. I do not believe that it is just about ‘Social’ + Customer Relationship Management ‘CRM’ either. To believe that customers can set their own hours is great in theory, but let’s be real. The transaction will never go away, it needs to become a stop along the journey, somewhere near the middle. Customer Relationship Management CRM does need to become outside in, but it does not need to become Social Customer Relationship Management CRM in order to get there. There are some other points to be made, but I would rather talk about the new and improved diagram; so we can see what I will trash in another 16 months. A I little self-deprecation is good for the soul! For a diagram called evolution, it seemed more natural to represent the transition as a timeline, via past and future, as opposed to trying to definitely state this is X and that is Y. This is not a binary state diagram; it is a continuum of progress. If you are a practitioner within a company, or have clients, they are somewhere along this path. The “Past” might be 5 years ago, or it could last week. The future could be as close as tomorrow, or 5 years out. The segments outlined in the diagram are certainly not the only ones, this is not a complete list, nor is it meant to be one. Finally, while it might seem like a good idea to move everything at the same pace, it is not always possible. Should you ‘wait for stragglers?’; adopting certain parts ahead of others? Not a question I can answer, it depends. Front line Employees and their Managers were the only ones to have access to the technological components of Customer Relationship Management CRM. Looking forward, giving access to information and insights to as many people as reasonable needs to be considered. Depending upon where you on along the journey, the type of industry you are in and other factors will determine the specifics of who needs access to the system and data.